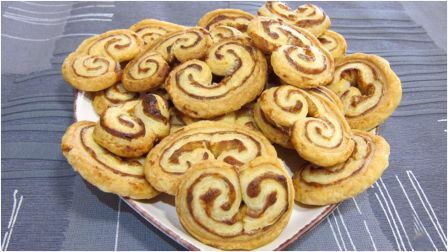 Sweet and surprisingly simple to make, palmiers cookies are French favourites (also known as elephant ears, palm trees or butterflies). They are light and sweet, ideal to have on hand to serve with a strong coffee. Drizzling a little honey on while they are hot is a divine touch also. You could also make a savoury palmier, filled with pesto, ham and cheese or olive tapenade and parmesan. These are good as a pre-dinner drink or lunchtime snack. Makes 30. In a small bowl mix the sugar and cinnamon. Lie your pastry flat on to the bench. Sprinkle over half of the sugar mix. With a rolling pin gently roll the sugar into the pastry. Tightly roll the pastry from one side into the centre, then from the other side into the centre to form the palmier shape. Wrap in plastic and refrigerate for 30 minutes. Remove from the fridge. Slice the logs into 1cm slices. Place on to a lined baking sheet. Sprinkle over the remaining sugar mix, pressing it in gently so they are well covered. Bake in the oven for 10 minutes, then flip and cook for a further 8 minutes. Remove and cool on a wire rack. For savoury palmiers, click here.